Q WHAT IS TESTING UNDER CLOUD? Cloud testing typically involves monitoring and reporting on real-world user traffic conditions as well as load balance and stress testing for a range of simulated usage conditions. · Load and performance testing conducted on the applications and services provided via cloud computing -- particularly the capability to access these services in order to ensure optimal performance and scalability under a wide variety of conditions. · Consumers can access the IT resources in the test environment. · Testing under the cloud gives very good sign by decreasing the manual intervention and reducing the processes in the typical testing environment. · After enabling of resources as and when they are required ,it reduces the investment on capital as well as enables the business to handle the ups and downs of the testing requirements. 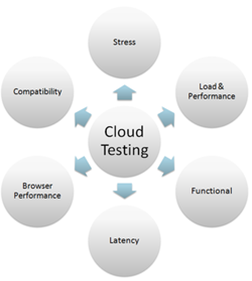 · The fig clearly shows that on the basis of these six parameters a cloud testing process can be performed. · Reduces capital investment and operational costs and not effect goal critical production application. · Offers new and attractive services to the clients and present an opportunity to speed cycles of innovations and improve the solution quality. · A value proposition is a brief statement about why your customers should purchase a cloud service model, and more specifically, why they should purchase YOUR cloud service model. · It should address cost versus benefit value, soft experience value and company values. Soft experience relates to any additional value your company can provide for your customer aside from the physical solution (such as education or help with sales training). · Values relates to how ethical the company is compared to what they say their ethical values are.